During the wire EDM process, a thin piece of single-strand, metal wire is fed through the workpiece and then submerged in a tank of dielectric fluid. The wire is constantly fed from a spool and used to cut plates, punches, tools, and dies for hard metals. This process makes it possible to cut and process materials that have difficulty with other EDM methods. 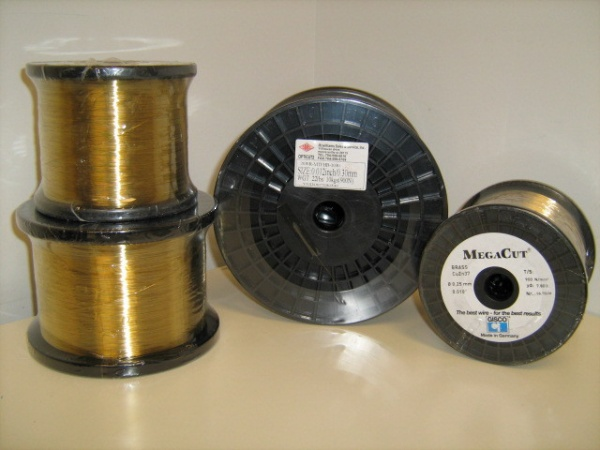 There are different types of wire that are used for a variety of different applications. Wire comes in different metals, shapes, and hardness. The three types of hardness are: dead-soft wire, half-hard wire, and full-hard wire. The hardness of wire refers to its ductility, or its ability to undergo elongation. The kind of wire you will need depends on the kind of machine you have. McWilliams Sales & Service supplies several types of wire for use in a Wire EDM. We will work with you to find the right wire hardness and material for your application needs. This type of wire is extremely malleable and can be bent easily into a variety of shapes. A soft wire has no memory, meaning it will stay straight when coming off of the spool. Because of this, a dead-soft wire is ideal for extremely high taper cuts. However, if you use dead-soft wire to create an element that will be put under a lot of stress, it is recommended to harden the wire after shaping. Half-hard wire is malleable, similar to dead-soft wire, but it will maintain its shape under moderate stress. It is useful for weight-bearing parts and can be used for an element that may be subjected to high stress. Unlike a soft wire, hard wire has memory and can keep the set or curvature of the spool if its wound tightly or on too small of a spool. Hard wire has an inherently higher tensile strength and can resist deflection under cutting forces like electrical or flushing. It is ideal for automatic threading machines. Tensile Strength: This is the measure of a material’s ability to resist breaking when placed under pressure. The tensile strength of wire will differ depending on the material it is made from. Conductivity: Many modern EDM machines require wire to handle large machining currents. Depending on the material of the wire, it will have varying levels of conductivity. For example, copper is a very conductive metal. Vaporization Temperature: Also referred to as flushability, the vaporization temperature is the point when the wire vaporizes instead of melts. This means it will begin creating gases instead of molten metal particles. The lower a material’s melting point, the easier it will vaporize. At McWilliams Sales & Services, we know that EDM wire and other consumables can greatly affect the quality of the finished product, as well as the efficiency of the EDM process. We supply all of the wire and consumables you need, no matter the make or model of your EDM machine.